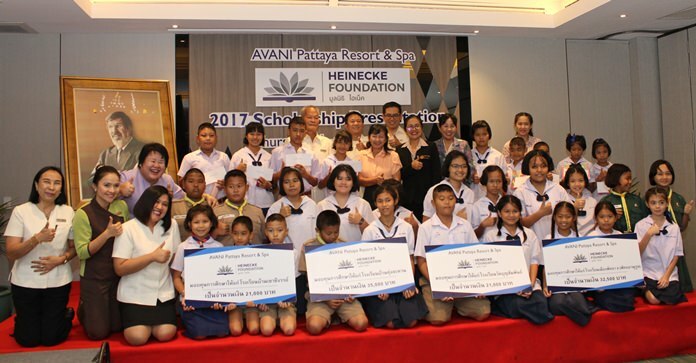 The Avani Pattaya Resort and Spa awarded 320,000 baht in scholarships to underprivileged students and children of hotel employees. General Manager Somsak Tanruengsri presented the stipends funded by the Heinecke Foundation, the charity organization founded by William E. Heinecke, chairman and CEO of Avani operator Minor International. Thirty students total from Khao Chee Chan, Tung­laharn and Wat Boonsam­phan schools as well as nearby Pattaya School No. 8 received 3,500 baht for primary school and 5,000 baht for high school. Another 29 scholarships were awarded to Avani staff. Nine families with primary school children received 5,000 baht each, while eight high schoolers got 6,000 baht. Seven college students received 7,500 baht and four university students got 15,000 baht each. Next articleA Trent XWB Turbofan for F1?